In addition, PSP ClassicQ offers a selectable simulation of class A circuitry and output transformer for a unique, vintage-style color. 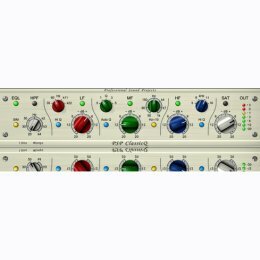 To its classic features PSP ClassicQ adds extremely useful features such as an adjustable high pass filter, switchable Q for low- and high-shelf filters, and a sweepable midrange bell-type filter. The design of PSP ClassicQ lends it especially well to fixing and shaping individual tracks.